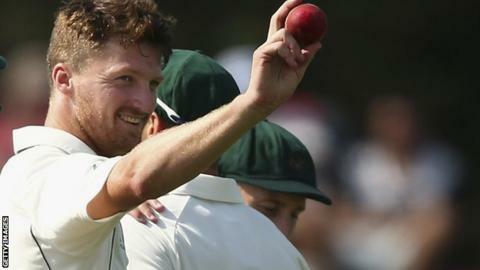 Nottinghamshire's late move to bring seamer Jackson Bird to Trent Bridge was made easy by the county's reputation, says director of cricket Mick Newell. The 29-year-old joined on Monday as a replacement for Peter Siddle, four days after his fellow Australian Test pace bowler was ruled out injured. "It was one of the easier contracts to pull together," Newell said. "It an easy place to sell. It's not hard to persuade people, we don't have to embellish." Newell says there were early indications that Siddle's back problem was serious, allowing more time to consider a replacement with the County Championship season starting in six weeks. The 51-year-old also said that batsman Michael Lumb, who faced Bird in Australia's Big Bash T20 competition, and Notts' former Australian limited-overs international David Hussey were key in convincing Bird to move to Trent Bridge for the opening 10 matches of the County Championship campaign. "They both put in a good word for Trent Bridge and Notts and how we do things," Newell told BBC Radio Nottingham.